At Oxford Hernia Clinic we specialise in providing hernia repair under local anaesthesia. We have performed almost 3000 hernia operations under local anaesthetic since the Clinic started 10 years ago. Hernia surgery is available for inguinal, epigastric, umbilical, femoral, incisional, Spigelian and sports hernia, using either local or general anaesthesia. We have a fixed fee of £1,870 for a unilateral inguinal hernia, umbilical, epigastric or femoral hernia surgery. We pride ourselves on keeping our costs simple and realistic. For self-pay patients we offer a fixed-fee with no hidden extras. The Clinic is based at the Manor Hospital, Oxford (Nuffield Health Group) a state of the art modern private hospital. The Clinic operates as a specialist hernia clinic through the hospital. The Consultants have full individual practice privileges and adhere to the Manor's policies and procedures. The Manor Hospital has a CQC Rating as Good. Oxford Hernia Clinic is a specialist hernia clinic operating under the governance umbrella of the Manor Hospital and Nuffield Health. We are dedicated to providing expert care at affordable prices. 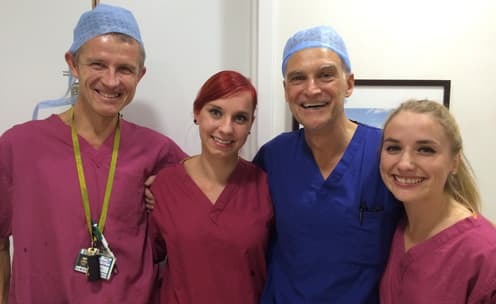 Our Consultants, Surgeon Greg Sadler and Anaesthetist Mark Stoneham have a specific interest in hernia surgery, especially under local anaesthesia and have build up a considerable expertise in this area of surgery with the nursing team of the Day Unit at the Manor Hospital. Oxford Hernia Clinic provides both knowledge and experience, having performed approximately 3000 hernia repairs since it was established in 2007. My overall experience was excellent. Throughout the process I was made to feel very comfortable. I travelled from North Wales in the morning to have the procedure and was back home by 2pm. I travelled home completely pain free. Went to Oxford because of the good reviews and cost, everything went perfect on the day, I had been concerned prior to my operation having cancelled a previous one with the nhs but spoke to Mr Sadler and he convinced me to go ahead with the procedure. I was also concerned about post op pain but had minimal discomfort on the day of the op (Friday) and by the Saturday just a day after I was no longer taking pain medication, this hospital is by far the best place to come if you have any hernia issues and I would not hesitate to use them again. It was so good to be treated promptly and with reassurance and care by the team. Thanks for your help, I am now fully recovered, have enjoyed my planned holiday in Tenerife and am back volunteering at the National Trust. The whole team worked well together. Both the surgeon and anaesthetist were reassuring, and professional, and the theatre staff relaxed and clearly competent. It was also good to find a choice of food and drink available post after the operation. Excellent booklet explaining operation, follow up, pain relief etc. Also detailed telephone explanation from surgeon beforehand. I was in severe hernia pain and the NHS could only offer me waiting times of months. OHC offered me an op within a week. Although I had to pay for the op myself, I'd do it again to be pain free in the shortest possible time. 2.5 months on, I am pain free and fully recovered. Was so pleased I chose the Oxford Hernia Clinic for my inguinal hernia repair. Everyone on the team was friendly, professional and clearly knew exactly what they were doing. No pain at all during surgery and I was pleasantly surprised at how little pain there was post-surgery when the local anaesthetic wore off. Five weeks later and I'm pretty much back to normal - just an occassional twinge. Started some gentle exercise after three weeks with no problems and now gradually inceasing frequency and intensity. Aiming to get back to full fitness by around week 10. The whole process was well managed and well explained. I was mildly surprised that I did not need a post-operative consultation but the accompanying information booklet provided all that I might need to know. Above all my repair was speedily and effectively completed. The Manor hospital was one of two recommended by my GP . I have had good reports re the Manor Hospital plus the treatment was less expensive and Oxford is reasonable easy to drive to. My wife and I have confidence in the "Oxford Hospitals ". After making contact we were dealt with very efficiently ,promptly and professionally by Leslie the secretary. I would like to thank Greg Sadler ,Mark Stoneham who explained the procedure and put me at ease and the rest of the team . The clinic provides a superb service - and at a very reasonable cost. I can speak highly enough of the whole set up - speedy, efficient and totally professional. I couldn't believe how straightforward it all was. I was back to normal far quicker than I expected, and am totally pain-free. I would like to make it clear that anybody who has a Inguinal Hernia to have it Surgically Treated by an experienced Surgeon as soon as possible and don't allow it to get larger. I wore various Trusses which helped initially . My Inguinal Hernia over 18 months got larger eventually pushing into my scrotum and I suffered from Flatulence pain and digestive issues .I honestly thought I had some sinister problem. Now having endured some initial pain for about a week after the Operation I feel great and am a very satisfied patient. I am a nurse myself and understand a little about this procedure. I searched the internet for a team that best suited my needs. I found Oxford Hernia Clinic to be outstanding. Both pre and post operation care. The procedure was painless. All staff are committed to your welfare. The following days after surgery were surprisingly almost painless too. I would highly recommend this team. I suffered for a year, I can now do all the things I could do before my hernia, like Yoga! Thank you all! I was very satisfied with the whole procedure. Everyone was very kind. Greg Sadler explained everything to me and rang me back to answer a query after my procedure. I felt in safe hands. An extremely efficient service. I would definitely recommend. Everything on the day of the procedure and most things after went exactly as described. In particular, I was sceptical that the sedative would stop the pain from the injections without making me sick, but it did.I was particularly concerned because an acquaintance had terrible pain after his surgery and discomfort for months. After some reading from various sources, I concluded that the best method was open mesh repair using open surgery without staples or stitches (using pro-grip mesh), and I am not aware that this is currently possible on the NHS. Also, I was fairly inactive in the last month before the surgery, so by saving probably three months waiting time I gained three months of active life. The service at Oxford Hernia Clinic was in my view superb. From my view there isn't any thing you could do better. Apart from the absence of a "greeter" on arrival in the clinic.Everything else, excellent. The op under local anaesthetic was totally painless and quite entertaining! Mr. Sadler responded promptly to a telephone call I made some weeks after the op, which was very reassuring. A very impressive set up. Lovely premises, very charming staff, who kept me fully informed of what to expect, and was going on at the time. The operation was quick and straight forward, and my recovery was remarkably quick. I would not hesitate to recommend this clinic to anyone that can not wait for the NHS to carry out their operations. I suffer from health anxiety and find it hard to trust people in the medical profession, particularly after a really bad previous experience. Everyone at the clinic went over and above to make me feel less anxious and at ease. The whole experience from start to finish was excellent and has helped to restore my confidence in all things medical. Due to my own issues I had some concerns after the procedure but Greg phoned me immediately and talked to me about all my concerns, which was exactly what I needed. I could go on waxing lyrically but suffice to say I am very happy with the whole experience. I cannot recommend all of Gregg's team highly enough. Outstanding treatment from Mr Sadler and Dr Stoneham - thanks so much. Found it hard to believe that I did not remember having the local anaesthetic, even though I was told I would not remember it. The operation itself was amazingly efficient and smooth, all the staff were lovely and gave clear, consistent advice re aftercare. Can't think of anything that could be improved upon - many thanks for excellent care. I had an excellent experience of having a hernia repair at the Oxford Hernia Clinic. The procedure was carried out under local anaesthetic which was not at all painful. The team were professional and friendly. The information given was very helpful and gave me confidence in my aftercare at home. My wound healed perfectly. I would recommend this service to anyone needing a hernia repair. I would recommend anyone needing a hernia repair to go to this clinic. It was a very good price in comparison to other hospitals, and I felt reassured because the surgeon has a very good reputation and has done over 5000 procedures. No pain at all, just a bit of tenderness but was not uncomfortable or unmanageable. I chose Oxford Hernia Clinic for the quick turnaround time from consultation to surgery and the fact I could choose a date suitable to me. The most fantastic experience I have ever had in a hospital. I can honestly say there is nothing that can be improved. Extremely impressed from start to finish so a million thank yous. Friendly efficient service from all staff involved. Full explanation given at every step of the procedure, including what to expect in terms of recovery. I chose Oxford Hernia Clinic because they were able to fit me in for the operation in the time frame that I wanted.